For superior installation and maintenance or service of your heating, ventilation, air conditioning or refrigeration system, you can depend on our NATE-certified technicians. 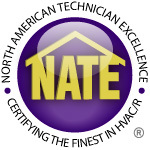 NATE certified technicians are skilled professionals who have proven their knowledge in the HVAC/R industry by passing specialized NATE certification tests. Learn how you'll benefit from hiring a NATE-certified tech. From air conditioning and heating installer certifications to residential and light commercial maintenance, NATE techs are the best in the business.